Valier High School "Blue Birds"
Valier (population 662) is located along Il. Route 148 at Park Street Road in eastern Franklin County. This places Valier in the southern tip of Illinois about 25 miles northeast of Carbondale. The A, T & SF Railroad runs north and south through the west side of town. The east side of town is surrounded by two branches of Andy Creek. Valier was established in 1905 and named after Albert and William Valier who owned the land on which the village was platted. 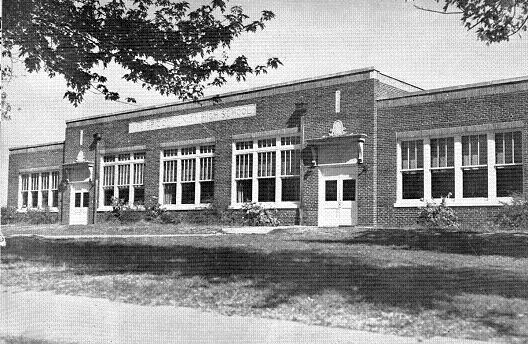 1926-27 - This is the first school year to hold classes in the new high school building. The school existed for 38 years until talks of merging with nearby Sesser High School began in the early 1960s. These talks became a reality in 1966 when Valier High School and Sesser High School merged to create what is now known as Sesser-Valier High School. The Valier High School building was taken down in the late 1970s. The Valier Grade School building is still standing and is now used as a community center. The Valier High School "Blue Birds" competed in basketball, track, football, and baseball. When researching the IHSA web site (www.ihsa.org) it is obvious about one thing, the Valier boys could handle the "rock". More information is needed regarding the football and baseball. One Valier athlete did bring home a medal from the Illinois State Track Meet. The 1960 yearbook from Valier High School talks of the team competing in the Little Egyptian Conference. Member schools included Valier, Sesser, Crab Orchard, Woodlawn, Dahlgren, Royalton, Bluford, Waltonville, and Ina. The accomplishments of VHS listed by the IHSA are shown below. The Valier High School Blue Birds were truly some of the mightiest of the "mites". The Valier boys brought home an incredible 10 District Championships, 6 coming in the 1940s! We are hopeful someone will provide team records and coaches names. 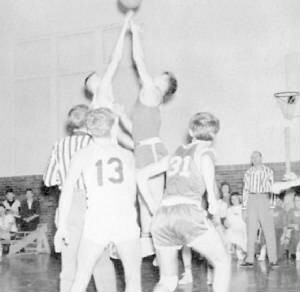 Basketball was a beloved sport in the town of Valier and surrounding area. The records and results weren't always great (however most of the time they were), but the town and farm families always supported their Bluebird teams. 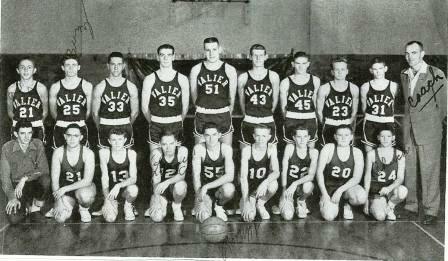 In the days before TVs, computers, and other current luxuries, Valier High School basketball was THE entertainment during the season. Several scores involving Valier High School in the IHSA State Tournament were located on a website titled "Illinois Postseason Basketball Scores." These scores are posted below as well. 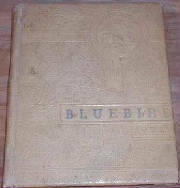 1922-1933 Postseason scores, records, and coach's names needed. **Senior year for All-Star performer Ted Farmer (#51 in photo above). Ted finished his career after the 1957-58 season with 2,410 career points which at that time placed him 5th all-time in IHSA history. His career average while playing varsity for four years at Valier High School was an impressive 24.2 points per game, often battling double team assignments to score his points. This total is still among the best in Illinois High School Association history, currently ranking as the 10th best in career average (2014 stats). Ted received a full scholarship to Southern Illinois University for his abilities. For more information regarding Ted Farmer please scroll down toward the bottom of this page. Bob Vincellini was a sharp shooting, highly skilled ball-handling guard for the Bluebirds this season as well. In 2015 Ted Farmer will be inducted into the Illinois Basketball Coaches' Association Hall of Fame for his efforts as a basketball player at Valier High School. 1963-64 Postseason scores, record, and coach's name needed. *1965-66 Postseason scores, record, and coach's name needed. *Final season as Valier High School. Consolidated with Sesser High School in the summer of 1966 to form the Sesser-Valier School District. A gentlemen with the last name of REA faired well at the State Track Meet, bringing home a 5th place medal in 1936. Coach's names, as we know them, are listed below as well. Valier High School boys did compete on the grid iron. J.C. Stoffel (Class of 1943) tells us that 6-man football was started at the school in the fall of 1939. Like all small schools Valier's faculty had to perform many tasks to make the school run. None was any more important than that of Coach. Coach Ralph Harkins filled these shoes well. He coached not only some of the Championship basketball teams but also coached baseball, track, and even 8 - man football during the short time it was offered at the school. A great basketball player and track athlete during the mid to late 1950s at Valier High School. In fact, Ted was one of the best basketball players in the state during that time period. His accomplishments are still rated as among the best in IHSA history today. Upon graduating from Valier High School Ted accepted a full athletic scholarship offer from Southern Illinois University in Carbondale. He had made plans to play three of the major sports offered at the school which included football, basketball, and track. In his freshmen year Ted incurred a major knee injury and a broken jaw, during football season. Though he would play football at SIU his sophomore and junior years. the knee injury prevented him from ever playing basketball again. Ted did, however, continue to excel in track & field at SIU. He was a top flight discus thrower and earned varsity letters all four years there. Ted set records for throwing the discus at SIU's stadium, the overall school record, and the conference record. In addition, he won the Illinois state title! Ted continued throwing the discus while serving in the United States Air Force. He won the USAF World-wide Championship there as well. Due to Ted's military and community service, and his successes in business, he later would receive Sesser-Valier School District's Distinguished Alumni Award. In 2015 Ted Farmer will be inducted into the Illinois Basketball Coaches' Association Hall of Fame for his accomplishments as a player for the Valier High School Blue Birds. A well-earned honor for Ted and Valier High School.